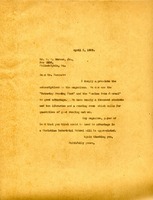 Having heard of the agricultural leanings of Berry College, Mr. Carrolls offers to send his copies of the "Geographical Review" and related magazines as soon as he's finished with them and assuming the college doesn't already have its own copies. Mr. Hornblower explains that he has delayed answering Miss Berry's. He says that he has all but a few issues of National Geographic and that he will forward whichever ones she would like. 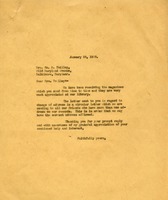 Mrs. Twilley sends a few magazines to the Berry Schools, praises the Berry schools and expresses her wish to visit Miss Berry again. 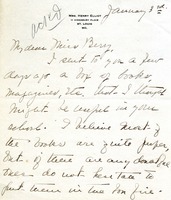 This is a handwritten letter to Martha Berry from Mrs. Kinston, regarding a donation of $5.00 and some magazines for the girls of the school. 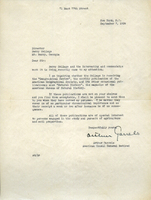 Letter to Mrs. Eva H. Burley thanking her for her interest in donating magazines for student reading. 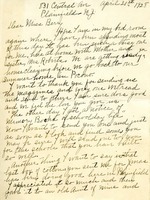 Letter to Mrs. Wm. 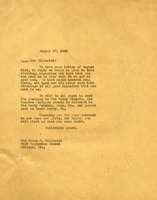 B. Twilley from Martha Berry concerning a change of address. 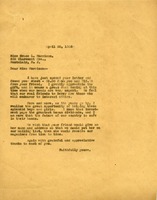 Letter to Grace L. Morrison from Martha Berry thanking her for her $5.00 donation and the $15.00 donation from her friend. Miss Berry then goes on to talk about how she has realized the importance of helping boys and girls and investing in their future's as well as the future of the country. 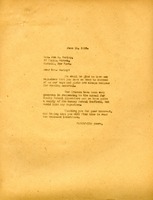 She also informs Miss Morrison that she would like her friend to leave her name and address so that she can be put on the mailing list to receive magazines form time to time. 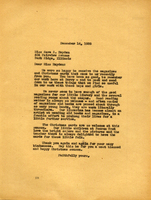 Bushnell thanks Miss Berry for the magazines she has sent, assures her that everyone has read them, and notes that they have been distributed to others. She mentions receiving notice of a "Memory Books of School day Life" and wants to send some to Miss Berry. 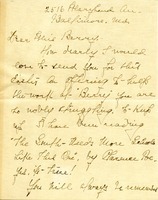 Bushnell thanks Miss Berry for her Christmas gift of a box of cotton and assures her that it is doing well in New Jersey. The cotton had been passed to a kindergarten teacher that found it most useful.